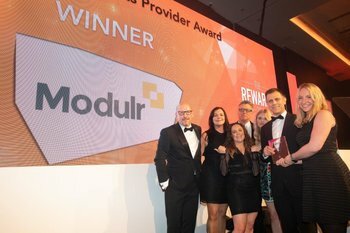 Modulr wowed a panel of 15 industry specialists at the Rewards 2018, achieving two top prizes – the Technology Award and the International Payments Provider Award. The Rewards is the biggest and most esteemed awards scheme in the rewards, payroll and HR calendar. This year it took place at the Hilton London Bankside on Wednesday 7th November, where hundreds of industry professionals gathered to celebrate the best of the industry. The whole team are thrilled to have come home with not one but two prizes in our first year of entering. The judging panel comprised of industry leaders from organisations including The Chartered Institute of Payroll Professionals (CIPP), The Chartered Institute of Personal development (CIPD), and PwC. On the International Payments Provider Award, they said: "Modulr was a clear winner, with consistently high scores reflecting a great business using technology to disrupt a traditional space in the market." On the Technology Award, they said: "Once again the judges were extremely impressed by Modulr. They said it is refreshing to see something genuinely new and innovative compared to BACS and other payment methods." Since the first pilot client went live in 2016, Modulr has onboarded more than 77 direct customers and processed £5.7bn of aggregate payment volume on its platform. The team has grown from 35 employees in December 2017 to 75, with plans to increase that number to 100 by the end of the year.